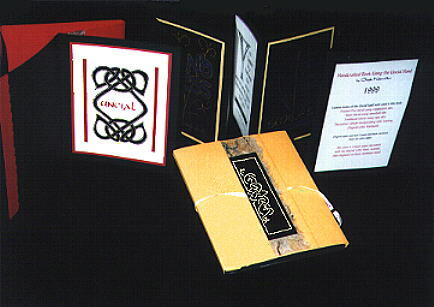 Various forms of the Uncial hand were used in this concertina book: Pointed Pen Uncial using copperplate nibs, Neon Uncial using speedball nibs, Traditional Uncial using tape nibs, Decorated Versals incorporating celtic knotting , Original Celtic Knotwork. Original paper used was Canson and black card stock. The books for exchange contained color copies. The cover is Canson paper decorated with the artist's original Celtic Knotwork, scanned, then engraved on black aluminum metal. Ribbon closure with slide up silver metal and black bead.